A photographer captured an amazing ten-minute battle between a harbour seal and a giant octopus in Victoria, Canada. Bob Ianson, who owns Heirloom Linens, was walking with his family when he saw the incredible scene and took out his camera. Speaking to The Huffington Post, he said: "Up popped what at first looked like two seals but once they got up to the surface I realised it was one seal with something in its mouth - which turned out to be an octopus. After around ten minutes, the octopus gave up but Ianson said it was not a one-sided fight. "The third time he came back up, the octopus was wrapped around the seal... The octopus literally had the entire head of the seal." 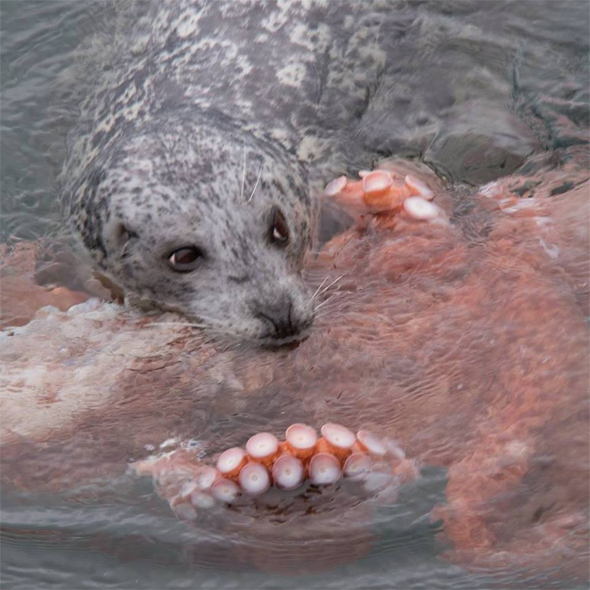 Research biologist Chad Nordstrom at Vancouver Aquarium told CBC News that while capturing the battle on film was rare, "octopus is a regular part of the harbour seal's diet".